We are over at the Home Depot to buy Vinyl Plank Flooring for Scampy. The flooring that was installed in Scampy at the factory, is extremely porous. Sorry, Scamp Trailer! 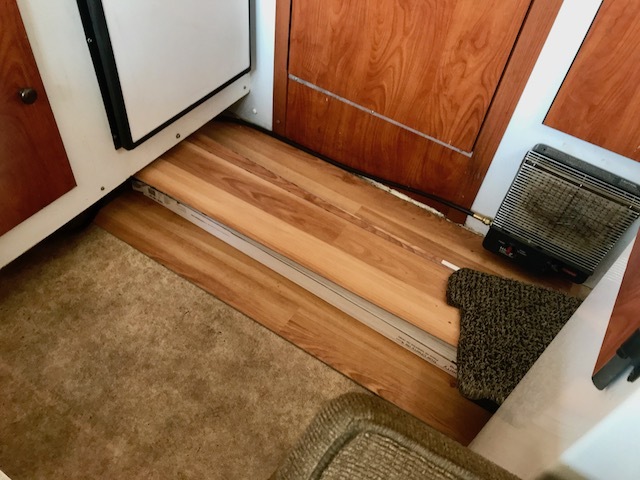 The vinyl flooring inside our Scampy is terrible. Dirt just looks at that flooring and shouts, "Oh boy! We are going to have a good time here!" Isn't flooring supposed to be non-porous? We have been thinking about what to do about Scampy's flooring for almost two-years! Today is decision day. Scampy's new vinyl plank flooring waiting to be installed. Yesterday we found a solution to keep Señor Tránsito's driver side door from closing on George's leg. ➜ A 1/4" thick wood shim that the closer would have to ride over. The shim was too thick. ➜ A steel shim that was only 1/16" thick. The closer bent this shim like an accordion. ➜ A steel compression spring. This worked! The spring had to be adapted to be able to remain in place. If you know George, you likely know that he very rarely gives up. That George sticks with things that need doing until those things just plain give up! This afternoon some things happened and I wanted to Blog to you about them using a video. So, I made that video! But, in order to show you that video, it must first be edited using iMovie. AND THAT IS THE RUB! I am absolutely unable to locate the damned video inside iMovie. It's not as though I am some kind of computer beginner. I should be able to rummage around inside iMovie and figure the thing out. Actually, I have edited a few videos using iMovie. IT IS FINDING THE VIDEO INSIDE iMOVIE THAT I DO NOT UNDERSTAND HOW TO DO. 1. I hunt around inside iMovie looking for my video. 4 I try something else. 5. I try another thing. 6. I find my video. 7. I do not know what I did to find my video!!!!!!! Please do not worry about me and iMovie. Because I just sent an email to the Geeks On Tour [Link] asking them for help. I have been t working since before daylight in iMovie to get where I am right now. Anybody who claims that iMovie is easy to use must be living on a world different than the one that I am living on! Hi George- could you tell us more about the spring you used on the door? What kind of spring is it? What size? And how did you attach it? Was it from Home Depot? 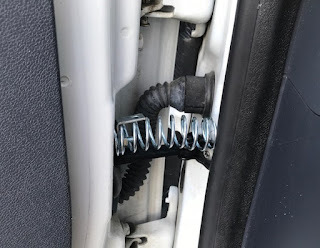 We have a car door that does the same thing, and being a somewhat rare older model car, cannot find a replacement mechanism that holds the door open. It is a compression spring. I size the spring to fit kind of tightly between the door and the frame post. I used common 1" 90° El brackets to attach the spring to the door and the frame post. If you do not know whaqt these El brackets are, get back with me here and I will take a pic of one and publish that pic for you to see. PS: If your car is a rare one, do you want to be drilling holes in the door and frame post just to keep the door from closing? The part that holds the car door open is the detent rod, aka check rod. Some people refer to it as the door hold-open mechanism. It has 2 detent positions which hold the door half open or fully open. Repair: The repair expense will vary depending on the make and model of the vehicle but it is typically very inexpensive. Depending the the type of detent mechanism, the parts kit can cost anywhere from $15 or $20 to $40 or $45 and the labor charge will usually be 1 hour at whatever the hourly labor rate is at the shop. It doesn't take an hour to do the repair on most vehicles but shops usually have a 1 hour minimum labor charge. I did take the Ford Transit to a Ford dealer to have the door check attended to. After the job was done, it was no better than before! The service manager was unsympathetic with my telling him that it had to be better than that! He told me, "That is the way that your truck is designed. Nothing more can be done!" So, Bob, I paid Ford for nothing! But! I engineered a fix that works! I've completed the door stop repair. Hey George, I just answered your email re: iMovie. But ... I read this post of yours and notice that you say "in order to show you the video it must be edited in iMovie." I just want to be sure you know that you can upload the video straight from your camera roll to YouTube if it doesn't actually need any editing. Just open the video on your phone, tap the Share button (square with up arrow) and choose YouTube. You will be prompted to log in to your Google account and Allow access, then fill out the form for your video and tap Publish. I like to edit my videos. If I don't, then from the time I click to begin the video to the time when I walk into the shot remains. I like to strip off the beginning and ending parts of videos to remove those clip ends. Have you looked at my YouTube channel? Back several years ago, I was kinda active into videos. Click [Here] to view my YouTube channel. Y'know, if all you want to do is trim the beginning and end of your video, you can do that with Google Photos - no movie making app required. Now you can share this to YouTube.